Video submissions are due on June 16, 2019. The winning entries will be announced in late July 2019 and will go live on August 8th, 2019. Please submit all applications via the submission form. Family fire is a shooting involving an improperly stored or misused gun found in the home, resulting in death or injury. Incidents include unintentional shootings, suicide, and other gun-related tragedies. Unintentional shootings: Eight kids a day are unintentionally injured or killed by family fire. 4.6 million kids live in homes with an unlocked and loaded gun, and 75% of these kids know where firearms are left kept in the house. Suicides: 60% of all gun deaths are by suicide and access to a gun increases the risk of death by suicide by 300%. Other gun-related tragedies: Over 75% of school shootings start with kids having access to unsecured and/or unsupervised guns at home. Given that there are more than 35,000 gun deaths per year in the United States, many of those related to family fire, the End Family Fire campaign aims to reframe what it means to have a gun in the home and reinforce the importance of safe gun storage. Create a video which encourages safe gun storage practices in the home. Adults who live in homes with a gun. Many adults bring guns into their homes because they want to protect themselves and their families. An important part of that is practicing safe gun storage because unsecured guns can be dangerous. They are receptive to messages that recognize how important it is to them to keep their loved ones safe. They are not receptive to messages that judge them for simply owning a gun, or messages that demonize guns in general. Know the risks of an unsecured gun and take the steps to end family fire. Visit EndFamilyFire.org to learn how you can protect your family and make your home safer. Do not incorporate guns of any kind in the video, including toy or prop guns. Must include the phase “Family Fire” and the website URL endfamilyfire.org in the voice over. Do not include logos or branding – or mention logos or branding – in the video. If the Video includes music, then the music must be original music created and owned by Entrant OR music found on YouTube Audio Library that you have express written permission to use and license. Videos should be either 25 seconds or 55 seconds in length. Start by mapping out an idea on paper. Write down as many ideas as possible, then go through your list and pick your favorite(s). Take those favorites and expand upon them, but ensure that your ideas are original. You can check that your ideas are original by doing a quick Google or internet search of your concept or keywords. One of the easiest creative traps to fall into is to assume that ideas that appeal to you and your peers will also appeal to your target audience. Your perspective is important but make sure that you also think of the issue from their point of view, not just yours. Don’t assume that the audience is eagerly awaiting anything you have to say. If the audience receives your idea as hostile or condescending, you have no hope of engaging them. But if the audience receives your idea as empathetic, relevant, and emotionally compelling, then you have a much better chance of engaging them. Your videos should be created to motivate, persuade and encourage adults to think about the dangers of an unsecured gun in the home, and take steps to mitigate the risks. Do adults know about the number of unlocked and loaded guns that are in homes with kids? Do they think that this applies to their home? A lot of gun safety messages use scare tactics or preachy messaging to address the consequences an unsecured gun. Do you need to show the consequences to communicate the importance of safe storage? Since adults are responsible for gun storage, how can you, as a young person, encourage them to learn more about a potentially sensitive issue? You have creative license to use popular culture, personal impact, real stories, or whatever moves you. Be creative and just make sure that your creative execution is in good taste, is non-partisan, non-political and not affiliated with any specific religion, comes from your heart, and adheres to the Official Rules. Always store guns locked, unloaded, and out of children’s reach. Always store ammunition separately from a gun—this reduces the risk of Family Fire by 61 percent. Consider offsite gun storage options in your area, especially if you or a loved one is in a time of crisis, and may pose a risk to yourself or others. From gun locks to safes, there are a range of effective solutions best suited for every gun and home. Always transport the gun inside of a cool, clean, and locked case or storage box. Have regular conversations about responsible gun-ownership and safe storage with those close to you to reduce the chance of family fire incidents. If you are not confident or have doubts about gun ownership, consider other home-protection alternatives, such as home alarm systems and guard dogs. Gun owners are highly encouraged to help end Family Fire incidents by educating friends, family and members of their community about responsible gun ownership. They first thing you must do is capture the attention of your audience. You need to create something they will notice and want to check out. There should be an emotional hook and immediate attraction to your PSA. Remember that you can make a difference. People wait their entire lives to affect positive change in our society. Through this scholarship, we are offering you that opportunity now. You have a unique, authentic voice and point of view. Your safety is our biggest concern. We ask that in the production of the video you do not incorporate guns of any kind, including toy or prop guns. 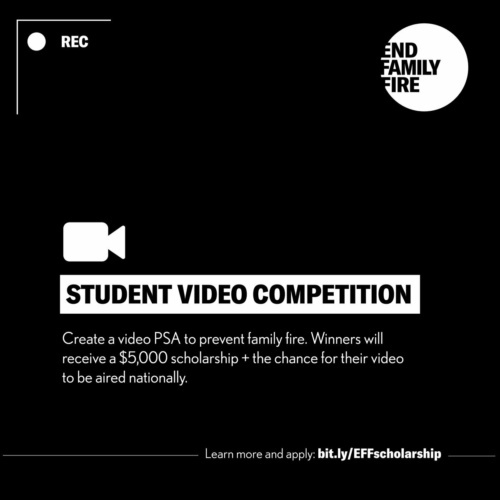 Please feel free to reach out to us with any questions you may have about the End Family Fire program or scholarship competition. Send your questions to [email protected] and we'll follow up with you as soon as possible. Please review the official competition rules here.